Since graduating with a Bachelors degree in Violin pedagogy in 2009, Johanna has worked for different music schools in Helsinki teaching both individual and group lessons to students between the ages of 5 and 30. 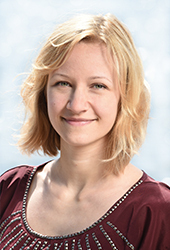 Johanna has conducted a chamber orchestra at the Lauttasaari Music Institute for several years. She is also qualified as a Level 1 Suzuki teacher. To maintain her own performance skills, she has also completed a solo specialization at Metropolia University. Along with teaching, Johanna actively performs in different orchestras and other versatile groups. In her lessons, Johanna seeks to create an encouraging and safe atmosphere to develop a pupil’s creativity, opinions, and self-esteem. One of Johanna’s philosophies is that although some tasks demand extra concentration and work, everything can be learned and the learning process can be fun. She seeks to emphasize that music can be experienced and created at all skill levels. During her free time, Johanna likes to spend discovering all kind of arts: music and visual arts of humans or nature. To relax she goes jogging, horseback riding and does yoga.